You are here: Home › Forum › Girls' Education › Can better sanitary care help keep African girls in school? In many poor communities, menstruation is still often seen as an embarrassing, shameful, and dirty process. Such taboos around the topic mean many adolescent girls are often unprepared for their periods and how to manage them. Less than half of girls in lower- and middle-income countries have access to basics such as sanitary towels or tampons, soap and water, or facilities to change, clean, or dispose of hygiene products. In Uganda, only 22 per cent of girls are enrolled in secondary schools, compared with 91 per cent in primary schools, with those living in rural areas being the least likely group to go to school. Researchers believe that the cost of hygiene products and the difficulties in managing periods play a key role in keeping girls out of school. Uganda, Kitengeesa. 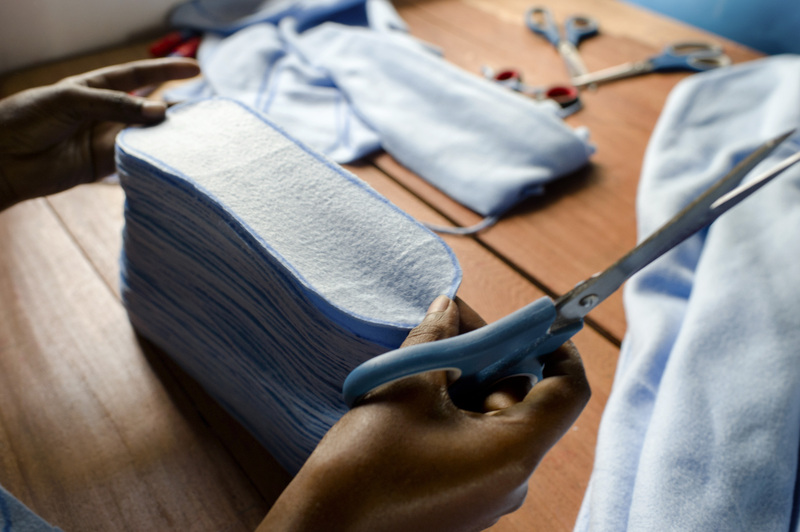 A worker trims and stacks sanitary pads before they are lined and sewn at the AFRIpads factory. Started by volunteers in 2009, AFRIpads manufactures reusable fibre sanitary pads. Credit: Nyani Quarmyne/Panos. Over 24 months, a trial was conducted in partnership with Plan International Uganda across eight schools, involving 1,008 girls, in Uganda’s Kamuli District, an area that had been observed as having low learning levels, as well as gender disparity in health and education. The research tested whether school attendance improved when girls were given (a) reusable sanitary pads, (b) adolescent reproductive health education, (c) neither, or (d) a combination of both. Girls were provided with AFRIpads, a washable, reusable cloth pad produced in Uganda, and locally-trained community health nurses held sessions that covered changes which occur during puberty, menstruation, and early pregnancy, and on the prevention of HIV. Researchers found that better sanitary care and reproductive health education for poor schoolgirls, delivered over two years, did appear to improve attendance. On average, girls increased their attendance by 17 per cent, which equates to 3.4 days out of every 20 days. The full impact story can be downloaded here. 3 Responses to Can better sanitary care help keep African girls in school? Very Nice analysis of the problem. Excellent. Thanks for sharing the helpful blog. Due to poverty, most of the rural area people are not aware of the sanitation and hygiene. Thus to make them aware ONG shammesh organizes the program where such people are taught the moral values to make them aware of such things. One can learn more here http://www.mission-humanitaire-afrique.org about different programs arranged by the mission humanitaire.